Kids Art with PaintByHand (Application) — Mobers.ORG — Your Daily Source For Mobile FUN! When you submit to the gallery, please include a first name and age of the artist along with a brief description of the art and selected works will be displayed on the website. 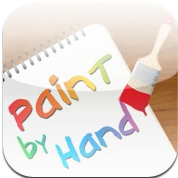 One of the best features of PaintByHand is the ability to easily share your work. With PaintByHand you can share your work via email or Facebook, save your work to your iPad photo library or submit your best work to our gallery. We get amazing work submitted every day.